office Convert Document To Pdf is the best choice for you to convert dozens of documents to popular formats in PDF format. It can support batch converting documents as Word (doc, docx, docm), Excel ( xls, xlsm, xlsx) PowerPoint (ppt, pptx, pptm) rtf, txt with high good quality for business and individual to improve the work efficiency. With this powerful converter, you can create PDF which can be viewed on any computer with a PDF viewer. It can retain the original document format. More setting options let you control the output file more accurately.Its professional and easy-to-use interface only allows you to create PDF files by simply click the "Convert" button. 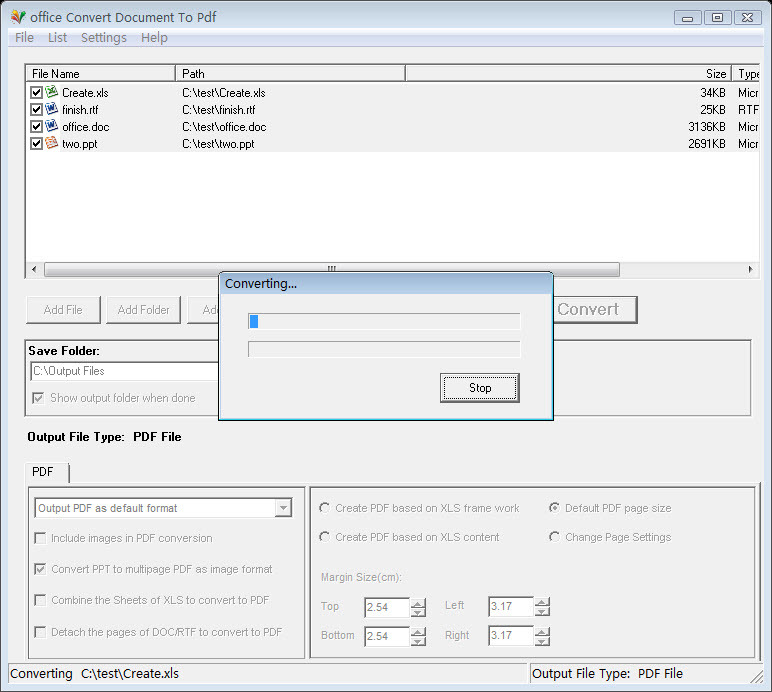 The Converter includes PDF options as Top, Bottom to get you required PDF file. Batch Convert Word (doc, docx, docm), Excel ( xls, xlsm, xlsx) PowerPoint (ppt, pptx, pptm) RTF , TXT to PDF. Support user defining the page size.